euro6208 wrote: Been reading alot about these Saffir–Simpson scale, Atlantic p/w, Atkinson-Holliday, and Schloemer equation ETC. What are those? Estimations....Only recon reveals the truth as seen in the Atlantic and loner Patricia. You know, by all those posts you have made about Patricia in the last couple years, are you perhaps jealous that a storm as strong as Patricia spawned in an area other then the WPAC? tolakram wrote: Stay on topic please. If you don't have anything new to say OR your reply is about another poster then please do not post. This thread should be a discussion, not a wish list. Just stating the fact that Patricia's have been occurring in the WPAC but with no recon. Now back to topic. I've seen this line of thinking thrown around quite a bit, and I'd like to challenge it with some actual data. 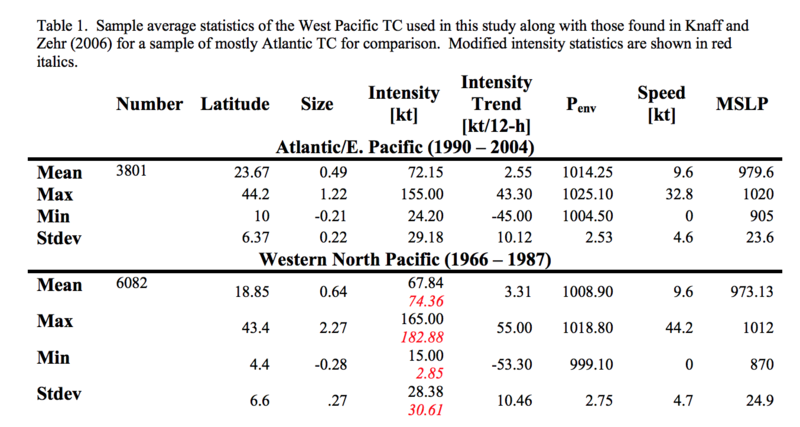 First, what actually constitutes high background pressures in the Tropical Western Pacific? To understand this, it is first imperative to know what normal background pressures are for the basin. Per Atkinson and Holliday, typical background pressures for the WPac were found to be about 1010 mb. Using the common practice that the environmental pressure of a tropical cyclone is 2 mb more than the pressure of the outermost closed isobar, that would be an average OCI of 1008 mb. As far as I can tell, on November 7th, 2013, Haiyan had an OCI anywhere between 1000 mb (JTWC best track) and 1008 mb (NCEP analysis), with JMA in between with an OCI near or just above 1004 mb (below). I'd probably lean more to the higher side of that range myself, but Haiyan's environmental pressures were average at the highest. For the record, the pressures surrounding Megi '10 were similar per NCEP and even higher per JMA and JTWC than they were for Haiyan! As far as subtropical ridging is concerned, Haiyan was indeed forced primarily westward at a quick pace by a powerful zonal subtropical ridge with 500 mb heights >588 dam. 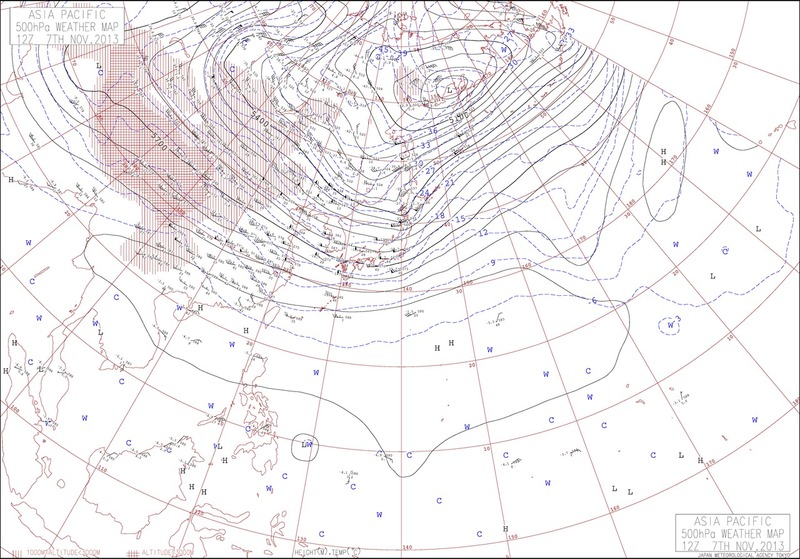 Per JMA analysis (below), the 500 mb ridge axis north of Haiyan appears to max out around 590 dam in the vicinity of 20ºN with some slightly higher heights off to the east near Wake. A strong ridge for sure, but very deep systems have been observed in the presence of such ridges. 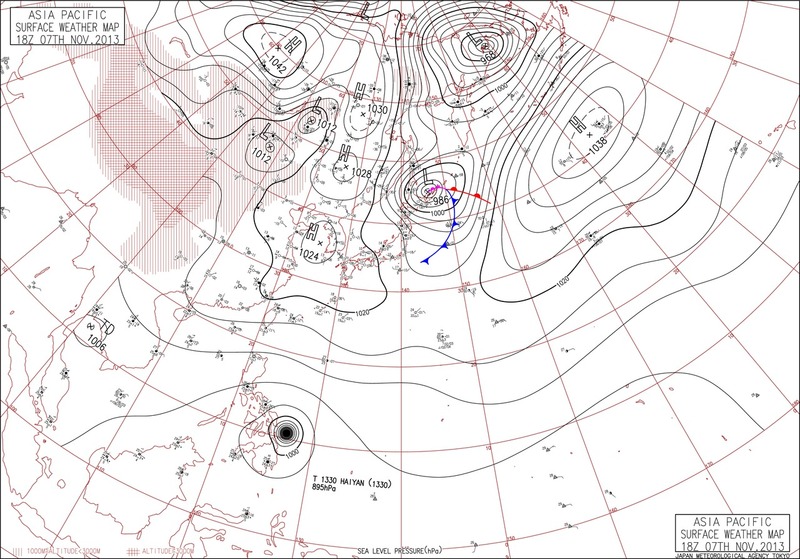 In 2010, Megi was forced WSW towards Luzon by a ~589 dam zonal thumb off the main >594 dam subtropical ridge (link). As far as track, environmental conditions, and intensity is concerned, Super Typhoon Rita from 1978 is quite possibly the best analog for Haiyan that we have. Rita had two peaks, with the first coming on October 23rd, 1978 and the second two days later on October 25th. Zonal subtropical ridging to Rita's north maintained >591 dam 500 mb heights on both the 23rd and 25th. The OCI started out between 1008 and 1012 mb on the 23rd before falling to values more similar to those with Haiyan by the 25th. 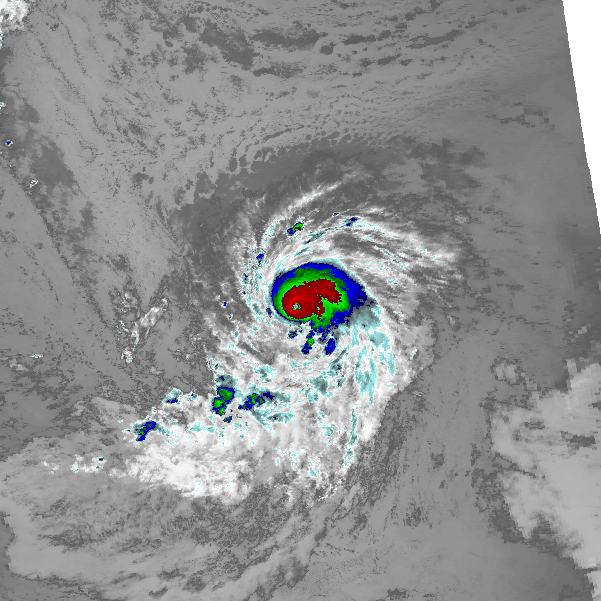 It should also be noted that Rita was a smaller than average system, particularly during the first peak on the 23rd. 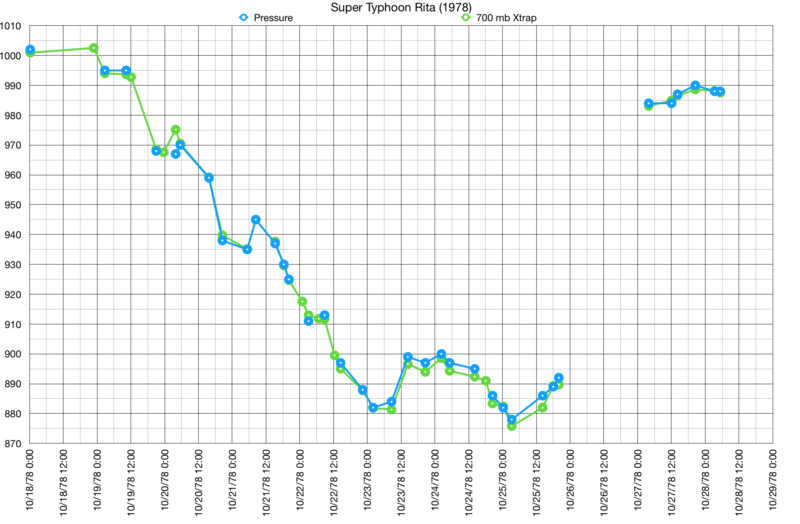 Despite this, Rita maintained pressures at or below 900 mb for three and a half days prior to a Luzon landfall, an incredible length of time, and with measured peaks of 882 and 878 mb on the 23rd and 25th, respectively. Using the 700 mb height of 2007 m from the 25th, the Jordan Equation estimates a 876 mb pressure at the same time as the 878 mb pressure measurement. The aforementioned 700 mb height is the fifth lowest on record, and only within 1 m of Nora '73 and 2 m of Ida '58's heights. Rita was clearly an exceptionally intense tropical cyclone. Below, I have the pressure readings and 700 mb extrapolated pressures from Rita's recon missions plotted out. Does this mean that Haiyan was as deep or perhaps even deeper than Rita? Not necessarily. Each individual storm is unique and has its own characteristics and quirks. However, I think it's silly to handwave Haiyan's pressure and say it's not for sure exceptionally deep. 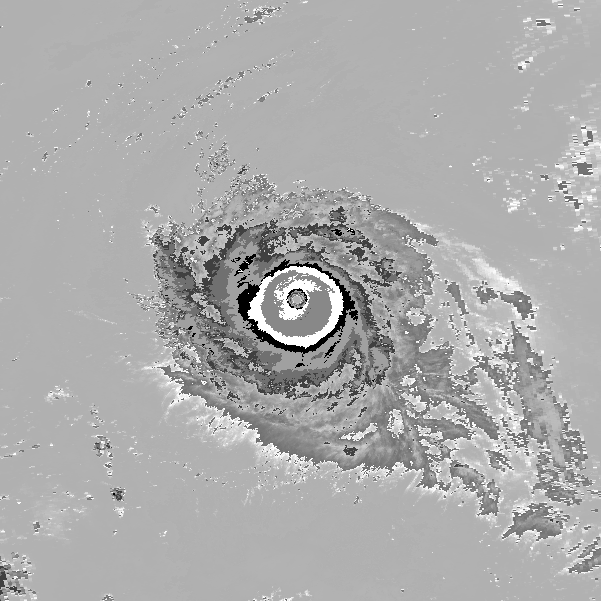 I honestly believe anything between the current official 895 mb estimate and Hoarau's 860 mb estimate could be a pressure that Haiyan was able to achieve at its deepest. I personally favor the middle ground of that range, somewhere between 870-885 mb, but it's unfortunately too difficult to pin down with high confidence. *Edits to clean up some wording and such. Last edited by 1900hurricane on Tue Nov 14, 2017 1:53 pm, edited 2 times in total. Of course, there is bound to be some error when using a statistical estimate. The primary reason I provided the extrapolations is to fill in a few spots where a pressure reading was absent (from the JTWC report, below). However, it's also worth noting that dropsondes did not record wind data at that time, so it also isn't impossible that actual pressure could be a couple of millibars lower than the measurement if the exact pressure center was missed. Regardless, the pressure readings and extrapolated pressures are all within a couple of millibars of each other near peak intensity. As for how AH came to their conclusion on WPac background pressure, it appears they used information provided by Takahashi. However, a study by Knaff and Sampson found an average environmental pressure of about 1009 mb for the WPac when using the 1966-1987 period, which is fairly close to Takahashi's 1010 mb used by AH. Haiyan? Megi? Other post 1987 typhoons? They are similar in both size and structure but Katrina is confirmed to be the stronger one despite looks a lot weaker on satellite. 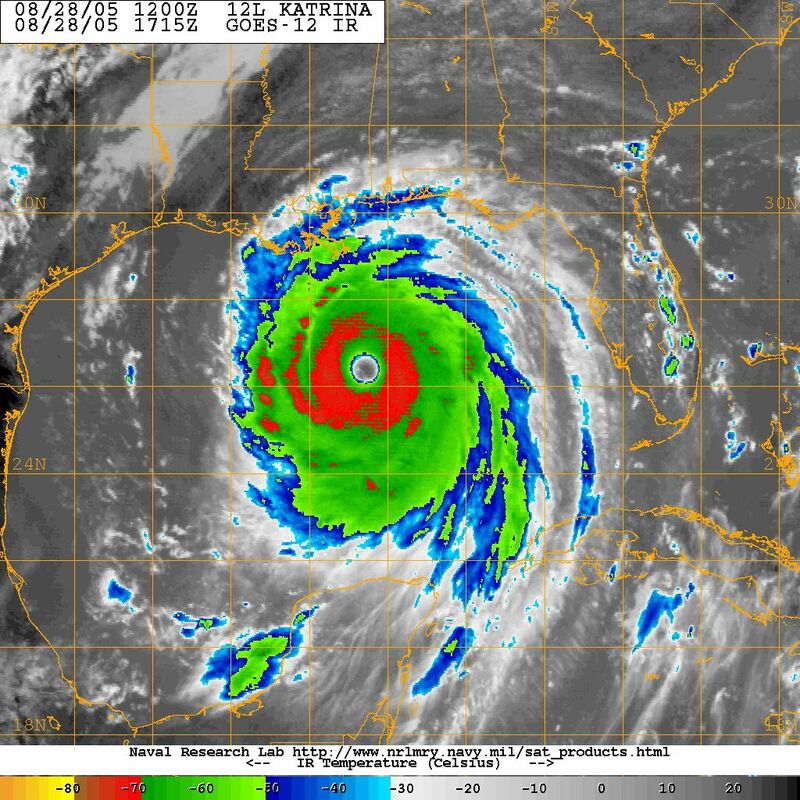 I realize this is an old post from the first page, but Katrina '05 and Jamgmi '08 are probably a little more similar in intensity than their best track intensities indicate. Katrina had maximum flight level winds of 166 kt (0.9 reduction factor estimates 149 kt at the surface) recorded at 1422Z on August 28th, 2005, while Jangmi had a similar 163 kt recorded at 700 mb (same reduction yields an estimated 147 kt at the surface) at 0617Z on September 27, 2008. Their measured pressures on their center passes were 907 mb and 906 mb, respectively. 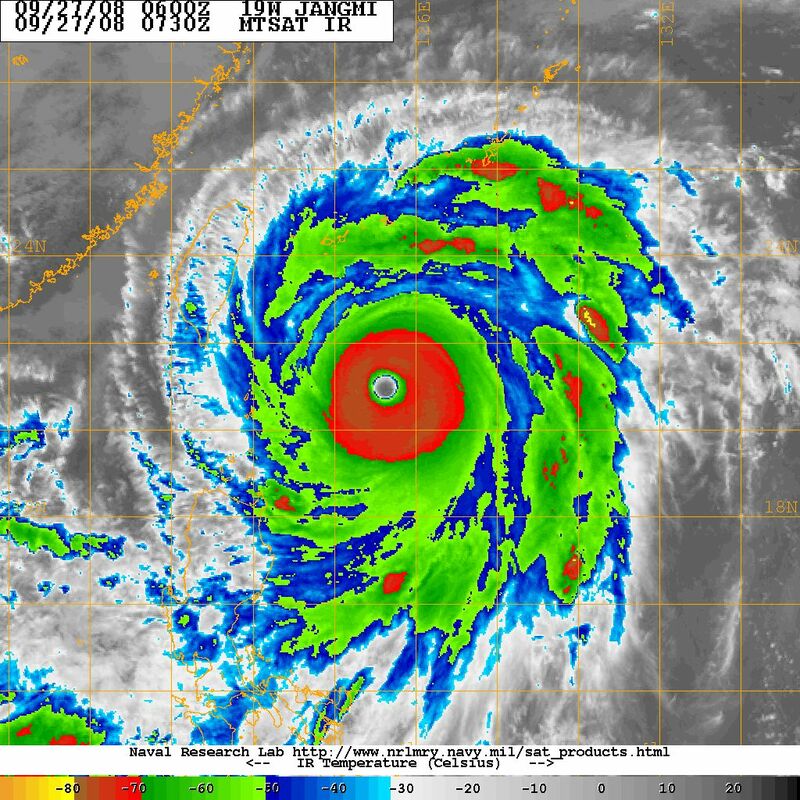 I'd still call Jangmi the more impressive of the two visually, but Katrina was at least a little more impressive around the time the highest flight level winds were recorded (below). Katrina's pressure bottomed out at 902 mb around 18Z, but flight level winds continued to decrease with time, perhaps due to a developing outer eyewall (also below). A great paper with data on Jangmi '08 can be found here. Isabel is the only storm in this era known to have reached cat 5 without Recon in the Atlantic. 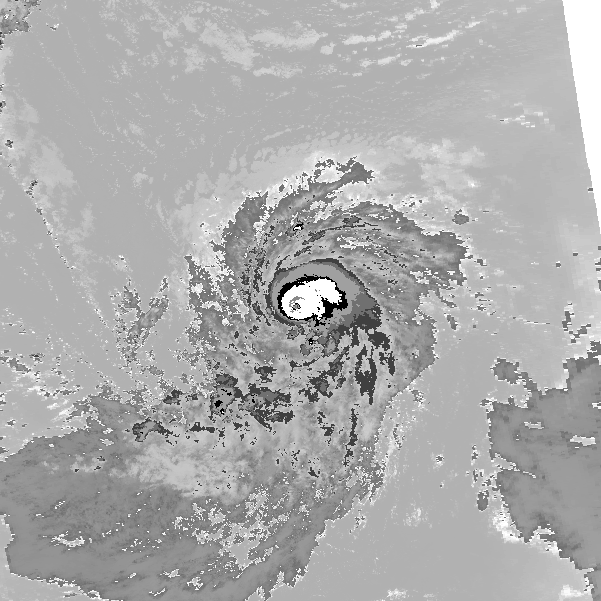 Hard to miss the clear-as day DT T7.0 that Isabel '03 produced over the central Atlantic. It's easily the best satellite presentation I've ever seen while east of the Caribbean, Irma included. For the most part though, the most intense systems happen in the western portion of the basin, where the waters are generally warmer and the tropopause is typically higher. Coincidentally, that's where the best recon coverage is, so it's somewhat more uncommon to have a particularly intense system outside the NAtl recon coverage area. However, I think one more storm that could be added to your list once reanalysis gets there is Hurricane Francis from 1980. This is a system that is operationally rated an entry-level category 3, but based on IR imagery, I think it's possible it could have been a category 4, perhaps even a very strong one while very far east in the basin. Last edited by 1900hurricane on Fri Dec 01, 2017 10:13 pm, edited 1 time in total. Frances 1980 looks incredible for a storm east of 30W. I agree that will probably get a big upgrade - I'd say that is T6.5 and I would go with an intensity of 125 kt there. I've just completed a little reanalysis on Super Typhoon Tip from 1979. It's nothing crazy complex, but I figured It could give a better representation than the current best track indicates. My mock b-deck in its current state is pictured below. Estimated maximum sustained winds rely heavily on the rounded off KZC values, but I did make a few slight up or down tweaks in a few places depending on the situation. I adjusted upwards a little bit on some of the rapid/explosive deepening phases and downwards in places where Tip had weakened after peak intensity and was dealing with eyewall replacement/structural issues. Below, I have plotted the original best track wind values, the raw KZC wind outputs, and two slightly different versions of winds expected from Atkinson-Holliday: one using the default environmental pressure and the other using my analyzed environmental pressures. As you can see, the original best track intensities closely follow the AH values for a significant stretch of Tip's life. Interestingly, it's also worth noting that the KZC and AH expected winds are basically the same for a good chunk of time following peak intensity. This is largely due to massive TS wind radii. 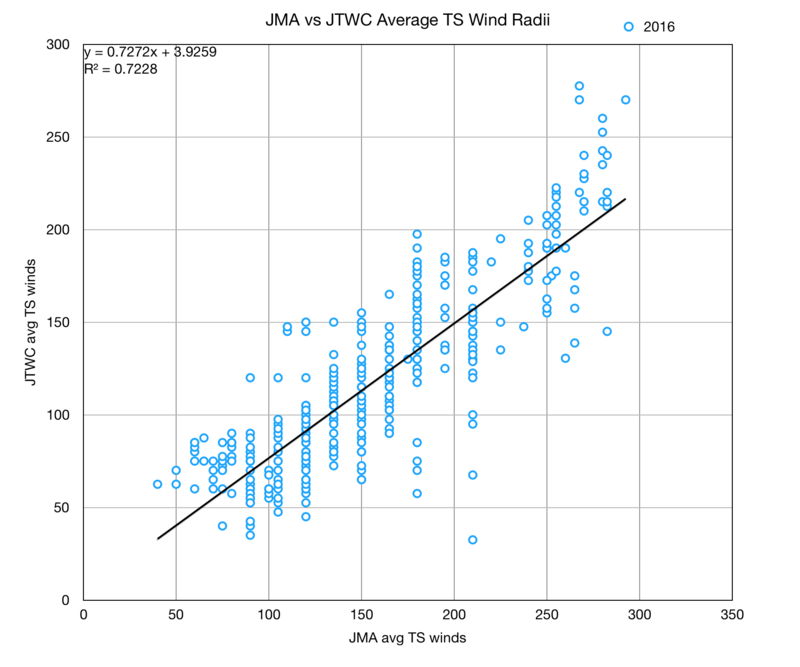 Speaking of TS wind radii, I actually made the average TS wind radii estimates myself based on regression between JMA's listed 30 kt wind radii and JTWC's 34 kt wind radii for the 2016 Typhoon Season. I wanted to include more seasons originally in my regression analysis, but JTWC did not quality control their 34 kt wind radii prior to 2016, and it's entirely absent prior to 2004. In stark contrast, JMA has good 30 kt wind radii data dating back to 1977, conveniently provided by Digital Typhoon (which is also where I gathered my OCI data, as well as viewed satellite images). I used the windcode 'AAA' in my mock b-deck, meaning extending all the way around the circulation. Unlike a normal b-deck however, mine is an average rather than a maximum extent, since that is what I used with KZC. I might go back and try to do semicircle data at some point based on the JMA data. 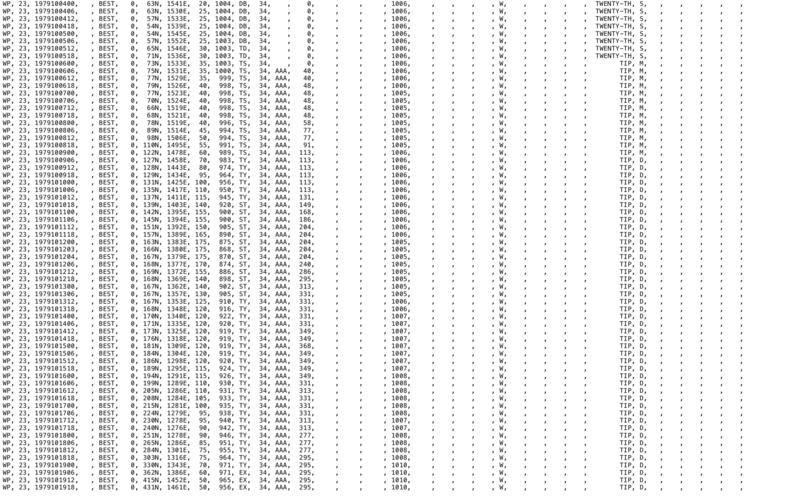 NotoSans is also putting together a hurdat type file for the WPac, so I'll probably do a second estimate based on his wind radii when I get the chance. Tip had good recon coverage for basically its entire life, which resulted in a good central pressure dataset. I followed it very closely, finding little reason to deviate from the pressures listed in the 1979 JTWC report. Unfortunately, some of the biggest gaps in coverage came during Tip's two most prolific deepening phases. The second one in particular is most troubling since it involves Tip's maximum intensity. 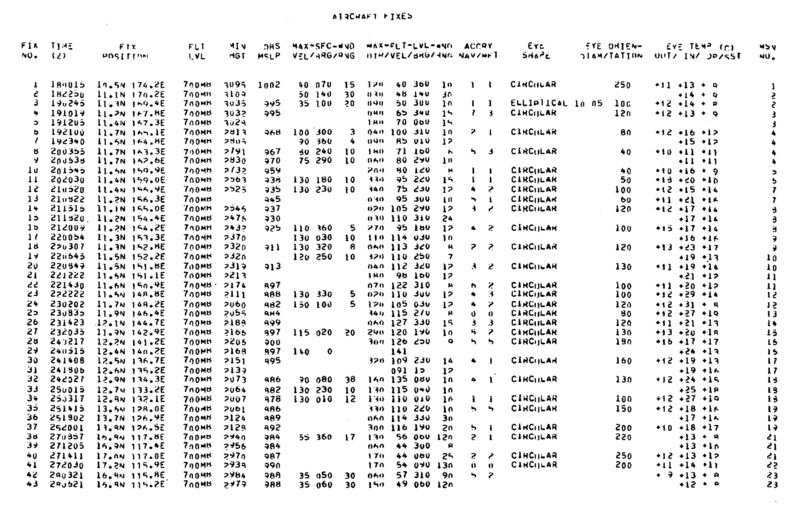 At 0353Z October 12th, 1979, recon flew into Tip for the first time in a little over 12 hours and recorded the record low 870 mb central pressure, a pressure 30 mb lower than the previous plane found. However, subsequent passes found that the pressure was rising fairly rapidly, and the pressure ended up rising back above 900 mb about as quickly as it fell. The real question is how much deeper, if any, was the pressure prior to the 870 mb pass? This is one I struggled with for a little while, but I ended up settling on an 868 mb pressure at 03Z October 12. This is after the coldest CDO cloud tops observed between 18-00Z (a time period where I nudged the winds up a little above the KZC values), but also coincides with the warmest eye temperature measured by geostationary satellite imagery, about 22ºC. Even with today's high resolution satellites, that is an extremely high value. Furthermore, the 30ºC 700 mb temperature measured by recon on the 870 mb pass indicated that Tip was likely still near peak intensity. 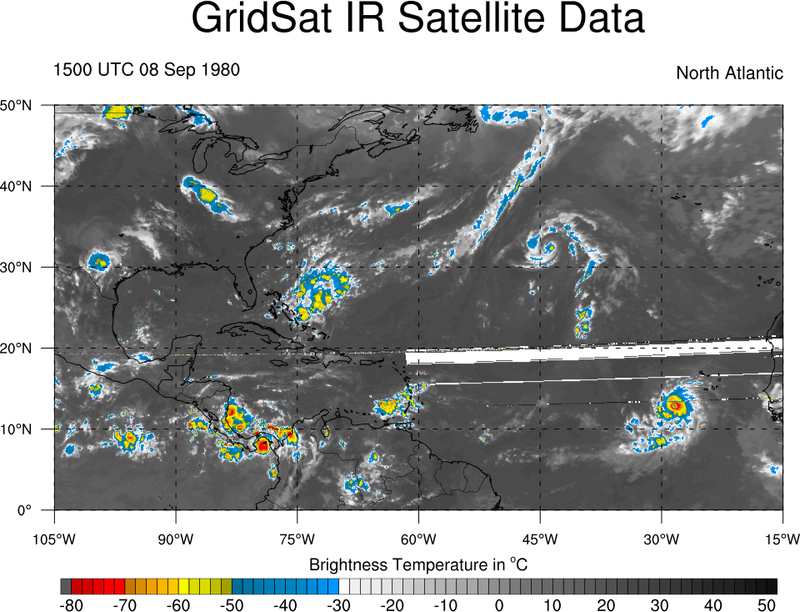 Satellite presentation began to more quickly degrade after 03Z. My 175 kt peak intensity estimate matches up well with the 173 kt estimated by Veldon's ADT study, which makes me optimistic that my values aren't garbage, especially since we arrived with similar numbers with very different methodologies. I'm looking forward to reanalyzing more systems in a similar fashion, but I'm not quite sure if I should try analyzing some of the other more impressive systems like Rita '78, Forrest '83, and Vanessa '84 or if I should try finishing off the other systems from 1979 like Alice, Hope, Judy, Owen, and Sarah before moving onto other systems. Regardless I'm looking forward to reanalyzing more systems! Last edited by 1900hurricane on Sat Dec 02, 2017 9:13 am, edited 1 time in total. So a gap in recon between the first and second peak, makes you wonder if other typhoons experience the same thing. Hence missing the lowest pressure and highest winds. 12 hourly recon fixes are pretty common for tropical cyclones not imminently threatening land even today in the NAtl. Prior to passing Guam, Tip had nearly continuous recon coverage prior to passing by Guam, but that dropped to the 12 hour fixes once Tip was no longer threatening the US territory. Recon was also running missions into Typhoon Sarah in the South China Sea at that time. Obviously, more coverage is better, but 12 hour fixes coupled with satellite imagery is usually good enough to estimate system intensity with a good deal of accuracy, barring the system being monitored doesn't change intensity quickly both up and down. Unfortunately, that's exactly what Tip did, similar to Patricia '15 in that regard. I agree about Hurricane Frances (1980) being more intense. I would not be surprised if it was a Category 4. Ptarmigan wrote: I agree about Hurricane Frances (1980) being more intense. I would not be surprised if it was a Category 4. What site has those old satellites? I'm curious about other older storms. Yep, that's exactly where I acquired those images. 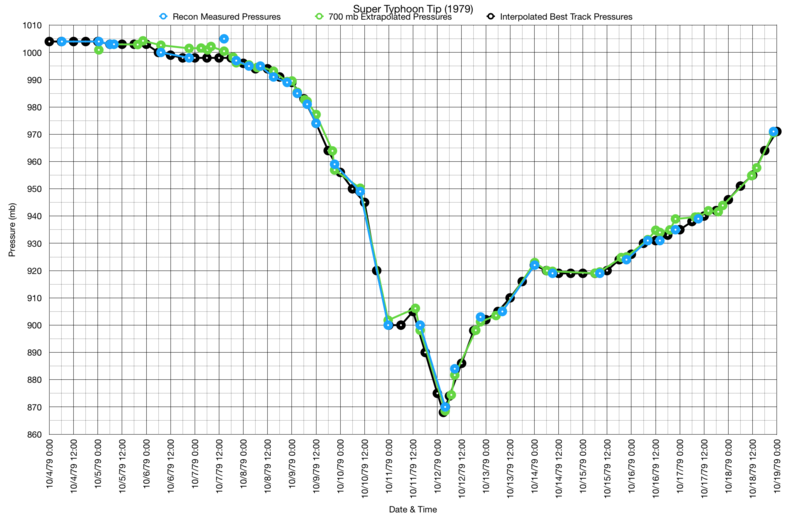 I ran the original Tip best track and my reanalyzed version through an ACE and PDI program to compare the changes. ACE went up about 2.7 units and PDI went up about 5.5 units after my reanalysis. Also with Isabel, on September 11, 2003, that is almost T7.5. Given that Recon found 140-145 kt winds the next day (pressure 920mb) when its presentation had deteriorated a fair bit (about half a T number decrease), I would probably set its peak intensity at 160 kt. It probably also became a cat 5 sooner, perhaps as early as the afternoon or evening of September 10. 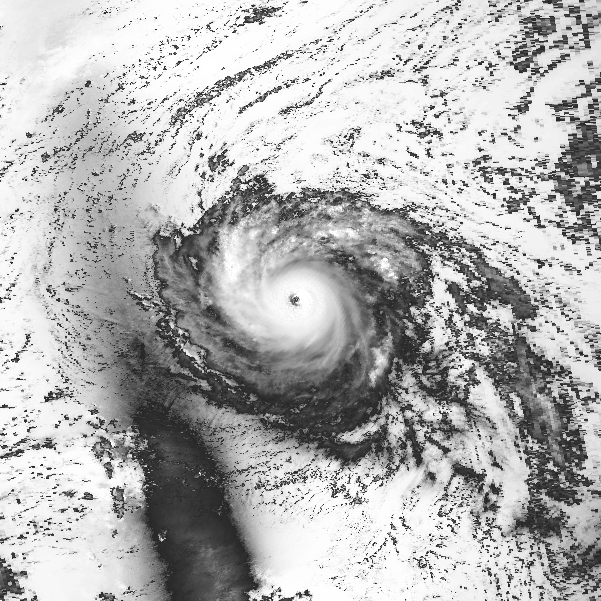 What would the KZC be for Isabel using a 160 kt intensity at its pre-Recon peak? Regarding Frances 1980, it certainly could have been really strong. But since Recon was never available, going outside of normal Dvorak ranges is not possible (it can't be proven if it over-performed or under-performed). The biggest changes are pre-Recon, but I do think it was a bit weaker in the period from September 15 to 17, as it was undergoing major structural changes. No changes are made at landfall, as the 90 kt intensity is supported by then-experimental SFMR readings. Last edited by CrazyC83 on Mon Dec 11, 2017 3:05 pm, edited 1 time in total. Also, here's the straight KZC rip off the b-deck (wind to pressure). And for good measure, KZC pressure to wind.